My husband and I braved going to an auction this afternoon. I came home with a Jeep-full, but I froze my toes and fingertips off to do it, as all the old “junk” I love is always sold outdoors and the finer antiques are sold inside the auction house. Assuming the sun comes out enough to give me decent light to take some photos, I’ll be sharing some of my finds with you later in the week, but right now I want to give you a “heads up” that I’m one of 13 bloggers taking part in a absolutely wonderful giveaway of all handmade items. The giveaway starts early tomorrow morning. 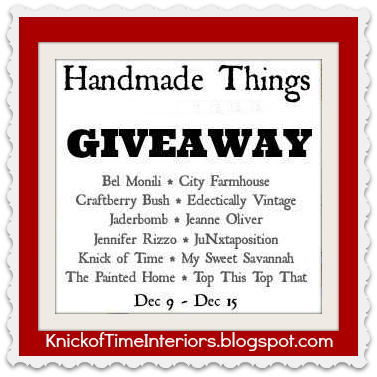 I can’t wait for you to see all the lovely prizes, but you can see a list of all the wonderful bloggers who have created a handmade item for the giveaway. There will be 13 winners, so lots of chances to win! I also have a question that I’d love EVERYONE’S feedback on. I’m not a techie person, and I blunder my way through social media, so I’m really curious what forms of social media YOU access on a regular basis and what your preferred method of getting blog updates is. So, if you wouldn’t mind taking a moment to leave me a comment about what social media you access regularly (Facebook, Pinterest, Google+, Twitter, StumbleUpon, Digg, etc. ), that would be great. I’d also love to hear what your preferred method of blog reading is – visiting blogs directly, email updates, RSS feeds, weekly/monthly newsletters, etc. I hope to see you in the morning!! I use Twitter more than anything else, then maybe Instagram. I use an RSS reader for my blog following and it’s called Feeder. I use FB occasionally, but I visit my blogroll. That is how I have done it for five years. I like to see my blog list of favorites to visit and I look at pinterest some….but mostly just blog! Hugs! I have all the blogs I read added to “My Feedly” through feedly.com. When a new blog post is written by you, or the other blogs I follow, it shows up on the My Feedly list with the title and a short description and photo. I can either read it there on the feedly page, or I can go to the originating blog and read it. (Some blogs require you to go to their page, otherwise you just get a short truncated post) This makes blog reading quicker, but also means the blog writers must make a title, photo and first few lines of their posts which will encourage readers to read the whole post without clicking to delete it. I check in with Facebook and Pinterest pretty much daily, but also love reading blog posts! Not a big fan of using email for stuff like that. My Social Media of choice is FaceBook, Pinterest, Email and lastly my blog roll. I admit that I don’t use Twitter, or many of the others like Instagram. Old School I guess. I’m old! I just have my favorite blogs bookmarked and read them each night…Knick of Time is a favorite…love that you love Jesus, quote scripture and have a great blog and do such creative, charming things! I use Bloglovin to follow blogs, as well as following by email. I use FB, Pinterest,and Twitter…I often see your posts first on FB. Facebook (cause it’s quick and easy), and visiting blogs directly. Pinterest when I have time, and very little Twitter. I use Bloglovin to keep up with the blogs I follow, some FB, twitter and then instagram. I loose the ones I follow by email because I get so many emails 🙁 Love your blog! I use Google+ and I generally start every day by reading my blogs…kind of like getting the newspaper! I love this !! All the features. The spoon key chain LOVE . The type writer letters LOVE LOVE . just a loving it all my friend.